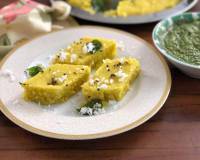 Makai Dhokla or Corn Dhokla is a light and healthy snack, made using fresh corn kernels and corn dalia. 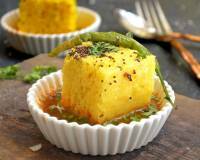 The corn dalia enhances the taste as well as the texture of the dhokla. 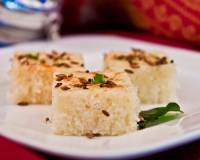 This instant Dhokla does not need any advance preparation and can be made using simple, easily available ingredients. 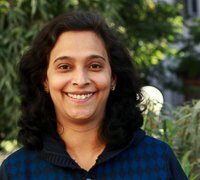 You can substitute the corn dalia with regular wheat Dalia or semolina in case you do not find corn dalia. 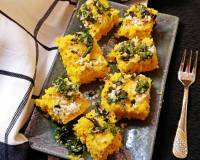 Makai Dhokla is a perfect snack box recipe. 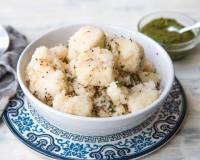 Serve Makai Dhokla with Dhaniya Pudina Chutney and hot Masala chai. 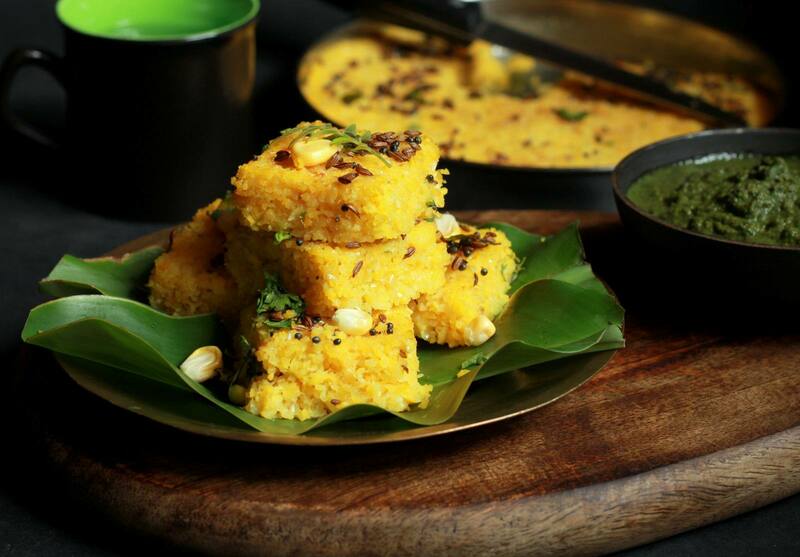 To begin making the Makai Dhokla, firstly crush the sweet corn in a blender along with green chilies and ginger. In a mixing bowl add the crushed corn paste, corn dalia and sour curd. 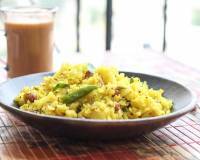 Add asafoetida, turmeric powder, salt, sugar, lime juice and mix everything well. Add water to make a thick, dropping consistency batter and keep it aside for 30 minutes. Meanwhile, prepare the steamer and grease two 8 inch steel plates or any moulds of choice with a little oil. 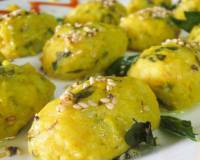 Add the fruit salt to the Dhokla batter, mix well and immediately pour the batter into the prepared plates/moulds. Steam for 12-15 minutes or till a knife/ tester inserted comes out clean. The next step is tempering. In a small pan heat the oil and add the mustard seeds and once they crackle, add the cumin seeds. Add the curry leaves, asafoetida and red chilli powder and take the pan off the heat. 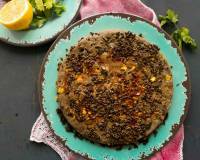 Drizzle this tempering (tadka) over the steamed dhokla using a spoon.